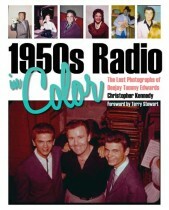 Between 1955 and 1960, popular Cleveland deejay Tommy Edwards photographed the parade of performers who passed through the WERE-AM radio studio for on-air interviews, shooting more than 1,700 Ektachrome slides. Following his death in 1981, most of the collection vanished and was presumed lost. The few images that remained were often reprinted and rarely credited to Edwards, labeled “photographer unknown.” Until now.